They say a picture is worth a 1,000 words. Well, this might take me closer to 1,200! When Barack Obama sought the presidency in 2008, opponents fostered a narrative that could have easily sunk his campaign. The story was that Obama was the unknown, the socialist…the left-wing radical. Obama said that Ayers was just a guy in his neighborhood, not someone “he exchanged ideas with regularly.” This rebuttal didn’t stop his Republican foes from jumping on his supposed radicalism during the general election. The Republican Party created barackbook.com (a spoof of the early Facebook) and listed Ayers as one of Obama’s friends. Three months before election day, Republican Vice Presidential candidate Sarah Palin went so far as to say that “Obama was palling around with terrorists.” That label stuck. Of course, Ayers wasn’t the only controversial figure linked to the Obama campaign. Obama’s own reverend was on the record saying some rather anti-American things. Obama had known Reverend Jeremiah Wright since the 1980s, when the future president was community organizing in Chicago. The two became close enough that Wright ended up officiated the Obamas’ wedding, and the reverend inspired Obama so much that The Audacity of Hope was based on one of Wright’s sermons. In the wake of September 11th attacks, though, Reverend Wright wasn’t so inspiring. He said, "We have supported state terrorism against the Palestinians and black South Africans and now we are indignant because the stuff we have done overseas is now brought right back into our own front yards. America's chickens are coming home to roost." Unfortunately for candidate Obama, Wright’s radicalism wasn’t just a thing of the past. In April of 2008, Wright announced to the NAACP in Detroit, "Africans have a different meter, and Africans have a different tonality. Europeans have seven tones, Africans have five. White people clap differently than black people. Africans and African-Americans are right-brained, subject-oriented in their learning style. They have a different way of learning." In that same speech, Obama mentioned another controversial figure, saying that when “Wright suggests that Minister [Louis] Farrakhan [the leader of the Nation of Islam] somehow represents one of the greatest voices of the 20th and 21st century… then there are no excuses” for Reverend Wright’s words. 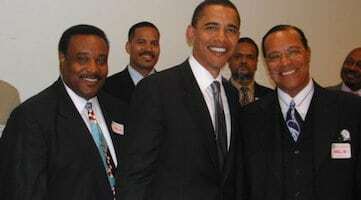 In combination with a photo with Farrakhan, Senator Obama’s relationship with Ayers and Rev. Wright would have looked all the more dubious. Likewise, his dismissal of Wright would have appeared disingenuous and engineered. Obama would have been a radical, not just in right-wing media, but on the left, too. The label, especially as the first African-American, major party candidate, would have been impossible for him to escape. We likely wouldn’t have had a President Obama. Instead, we might’ve seen another landslide, as Barack Obama joined the likes of Michael Dukakis, Walter Mondale, and George McGovern as Democrats who couldn’t hold their weight in the general election. I raise this hypothetical now because last week, a photo of a young Senator Obama and Nation of Islam leader Louis Farrakhan surfaced. Taken in 2005 at a Congressional Black Caucus meeting by photojournalist Askia Muhammed, the image shows Obama smiling with Farrakhan. If this photo had been public in 2005, I’m convinced it would have sunk his candidacy. The handwringing about Obama’s radical roots would have begun immediately and would likely have prevented him from being a candidate with a national appeal. And if the photo did not surface until 2008, it would likewise have become “the” narrative of the election. Consider that last week, on The Tucker Carlson show, Muhammed said that the Black Congressional Caucus made him not share the photo publicly, a sign that they realized the bad optics of the photo. The photojournalist also claimed—without proof—that members of the Nation of Islam worked on Senator Obama’s staff. Conservative media has latched on the narrative that this was a “cover up” and definitive proof that Obama truly was a radical. But here’s the kicker: Obama was no radical president. If anything, he was a left-of-center moderate. Domestically, Obama was a mixed-bag. His trademark legislation—the ACA—was a policy idea created by the very conservative Heritage Foundation and first implemented by the Republican governor of Massachusetts, Mitt Romney. For those who thought Obama might be a closet socialist, he surely disappointed when he followed through on George W. Bush's bailout of Wall Street and also refused to prosecute any of the major figures in the 2008 financial crash. He also stacked his deficit commission with fiscal conservatives. Meanwhile, President Obama was the biggest proponent to date of free market thinking in education, using his Department of Education to encourage and fund charters across the country. And while Obama might want to be remembered as an environmental champion, he ordered increased offshore drilling (until the BP oil spill). Although he tried to stay out of the Syrian conflict, President Obama’s foreign policy record suggests some serious neo-conservative habits. He went so far as to violate Pakistan’s sovereignty in order to kill Osama Bin Laden, a prospect for which he was ridiculed during the 2008 campaign by Hillary Clinton, Joe Biden, and John McCain. President Obama may not have favored the words “radical Islam,” but he significantly increased President George W. Bush’s drone strikes in the war against terror, and he never did close the Guantanamo detention center. The list could go on—Obama didn’t violate gun rights the way conservatives feared, and he was the deportation president. By Nate Silver’s measure, this political record made him a completely middle-of-the-road Democrat. DW-Nominate’s went one step further: the group estimated Obama was actually the least liberal Democratic president since 1945. Thankfully, the Farrakhan photo didn’t surface eight years ago. If it had, we would’ve missed out on a middle-of-the-road president due to some misplaced, media-driven hysteria. The next time some seemingly incriminating evidence surfaces, let’s remember this bit of history.